Medha Patkar and Arvind Kejriwal holding a panel discussion at the Conference. Also seen is Mr. SA Naqvi of Citizens Front for Water Democracy The debate on water privatization is an ongoing debate of public interest not only in India but globally as well. Supporters of privatization argue that water should be viewed as an economic good and hence commoditized. However, as recently as in 2010, the United Nations has recognized the right to water as a basic human right. This raises certain difficult and critical questions over the need and implications of privatizing water in Delhi. 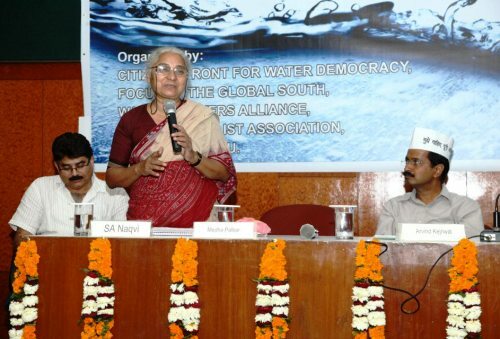 This was the central focus during a day long conference on 'Water Privatization: Learning from India and International Experiences' which was recently organized at the Indian Social Institute, New Delhi. Last updated by DG Correspondent at March 22, 2013 .